Capturing the Moment The Art of Travel Sketching was the title of her presentation and what followed was one of the most exhilarating and infectious nights we’ve experienced. Being an Architect, Liz explained that she had only ever drawn to describe her ideas, like the game Pictionary, she used drawing to find a solution to a problem. A dialogue between eye, mind and hand. She has never had any art training, not even at school. Instead she was an avid photographer. Her first Turning Point came 6 and a half years ago when a friend showed her a Cotman Watercolour Pan and she fell instantly in love…she had never even seen one before! The second, came on a trip away in the bush with other photographers, when her camera broke and she became bored and picked up a piece of charcoal and began sketching a tree. She was hooked immediately. From then on she wanted to record her days as visually as possible. Despite having no idea how to do anything, she just kept going. Also practicing from photos helped her along. Eight months later, on a trip through Europe she filled 2 sketchbooks and now she has over 100. Liz now defines herself as a “Sketch Book Artist”, with 95% of her work done in small books, “capturing and creating the moment”. It’s about the process rather than the product, of creating a narrative rather than individual masterpieces. Through a slide presentation of her works, Liz then took us on some extraordinary journeys around the world. She said to create a habit of making the most of opportunities and to sketch at home in training for your trip. Try sketching your morning morning cup of tea (one of her favourite things to do), your garden, your friends & family, get out on the street, or go to a Coffee shop. So, when on your trip, have a purpose. Liz is obsessed with Tea cups so when traveling from England through to Scotland, she chose to capture all the Great Houses and Great Tea Rooms along the way. Make it personal, draw what you want to draw. Also be prepared to meet people. You are never alone with a sketch book, it draws people to you. We were all reeling with laughter as she described her “Extreme Sketching” adventures: on a boat in Vienna in the pouring rain; on buses when it’s too bumpy to write, but you can draw; in taxi’s; on planes; waiting in long queues and in Japan, she even sketched throughout the whole performance of the Tokyo String Quartet, paints and all! She does love a challenge! Liz then gave us a 15 minute demo. She re-enacted a snippet of her travels in Rome with a non-sketching travelling friend, who had gone to buy some gelato while she very quickly sketched a building with an amazing baroque facade. She sketched at a furious pace using watercolour pencils and then a quick watercolour wash over the top. When her friend returned with the gelato, she did a very quick gestural sketch of it in ink, and then photographed it so she could add colour later that night. She also leaves space on the page to add comments later. 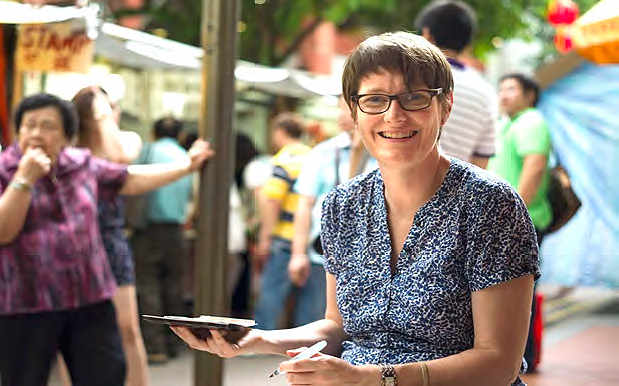 Liz is part of an International Network of Artists called Urban Sketchers and she has a blog site that she updates daily. www.lizsteel.com Her enthusiasm and energy seem inexhaustible, as does her determination and dedication to her art. Thank you Liz, for a wonderful evening. Liz will also run a KAS Workshop in November 2013.